While the recently held prestigious award ceremony of SIIMA honored the performances of some popular stars this year, it also had some interesting announcements and tributes as a part of the event. One amongst them was NTR biopic. 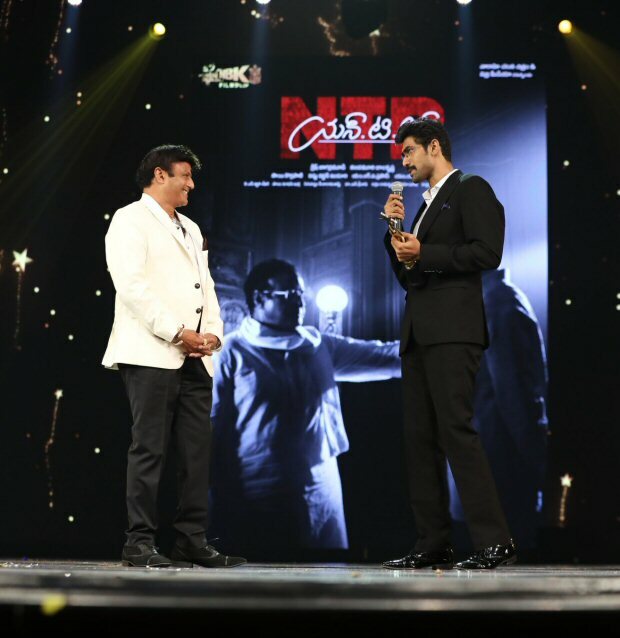 The film, which has become the talk of the town for its grandeur and ensemble casting, found its place in SIIMA 2018 in Dubai as Rana Daggubati and Nandamuri Balakrishna took on stage for its poster launch. For everyone who has been eagerly awaiting the NTR biopic, they would be aware that Nandamuri Balakrishan, son of NTR, will be essaying the lead role of his father in this forthcoming biopic. On the other hand, Rana Daggubati will be seen as the politician and the current Chief Minister of Andhra Pradesh, Chandrababu Naidu. While this piece of information released quite some time back, let us tell you that the two actors came together on stage during the SIIMA ceremony that was held in Dubai to present the new poster of the film. Readers may be aware that the shooting for NTR biopic has kicked off in full swing, including portions of which were shot in real locations like NTR’s residence in Abids, Hyderabad. Besides the two of them, the other actors featuring in the film include Vidya Balan, Rakul Preet Singh, Jisshu Sengupta amongst others. Directed by Krish, the film is expected to trace the journey of the actor turned politician Nandamuri Taraka Rama Rao. Coming back to the awards, Rana Daggubati won two SIIMA this year. He not only won in the category of Best Actor in a Negative Role for his performance in Baahubali – The Conclusion but he also won the Entertainer of the Year award at the same ceremony. He won the latter for his hit films which include Baahubali, The Ghazi Attack and Nene Raja Nene Mantri. As for Nandamuri Balakrishna, he won the award for Best Actor in a Leading Role, Critics choice for Gautamiputra Satakarni in the said event. Also Read: FIRST LOOK: Rana Daggubati as young Chandra Babu Naidu in NTR biopic demands your attention RIGHT NOW!